We are the #1 Platinum Certified Noritz installer in all of California and the number one Noritz tankless installer in the entire country! We have a 100% Price Guarantee. You will never over pay with us! Each and every one of our technicians is trained by Noritz. We guarantee same-day tankless water heater installation! No other company out there offers that! We never charge extra for nights & weekends. We guarantee convenience! Some gas companies will actually offer you a $150 rebate if you go tankless. Much safer in Earthquakes. No tank, No pilot lite = No fire. They can save your space and increases the resale value of your home. The warranty is best in the business! We offer a 12 year warranty. We hope these reasons have helped you decide that Noritz tankless water heaters are the best in the biz. If you buy a tankless water heater, you will benefit in some big ways. Not only will you not have to worry about running out of hot water, but you can also potentially save 40-50% on your gas bills for the rest of your life. This is because a tankless heater will heat water on demand meaning no storage or shortage of hot water! Imagine how great it will be to have an endless supply of hot showers while still having enough left over for the rest of your household requirements. The time has come to have an equal supply of hot and cold water. Contact us today! Tankless water heaters are incredibly durable. Not only do they last longer than all the other types of water heaters, but they require less maintenance over the course of their lifetimes. Arnett’s & Noritz want you to feel comfortable with your new tankless water heater so they have backed them with the best warranty in the industry. Tankless water heaters can deliver significantly more hot water than all the other traditional water heaters. Noritz tankless water heaters are the best in the business. The Noritz has some great features, including Quick-Connect and Multi-System options. Tankless gas water heaters work by heating water as it passes through the unit. That means that you will never have to use water that has been stored in an old rusty tank. You don’t want your water touching nasty rust! This usually starts happening in traditional tank heaters within a couple of years. Selecting a Noritz tankless heater can help you avoid this completely. 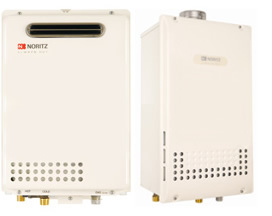 With its uniquely compact design, a Noritz tankless heater can be installed almost anywhere. Compared to traditional water heaters, one of the most obvious differences is its small size. There is a variety of choices when it comes to our tankless water heaters. They come in a variety of models and they can be mounted on the wall, either inside or outside. This is advantageous, particularly for those who don’t have a lot of extra space. Lower Water Heater Costs! Save on Your Bills! Tankless hot water heater will help you conserve energy while simultaneously saving you money. Our on-demand systems don’t require a pilot light and can potentially lower the cost of your current water heating bill by half. Every Tankless Water Heater Installed Removes 2100 Pounds of Carbon from California Air Every Year! We Removed over 1,200,000 Pounds of Carbon by Switching over to Tankless Water Heaters. You Can Help Improve our Air Quality and Ozone Layer by just doing your part to go Green! "We are fast and reliable." We only use the highest quality products for your home- so you don't have any problems later on. Its about our customers & the superior quality of the products we use. Call and a live operator will help you with your Water Heater Emergency. Our staff is friendly and willing to answer all your questions - Call now! We are in your neighborhood and can have a qualified Plumber there within minutes. All of our staff have been factory trained by Noritz Tanklesss Water Heaters and Bradford White Water Heaters. We repair any Make or Model of Water Heaters. All of our technicians are company employees, not sub-contractors. A technician should arrive at your home in uniform with a truck that is fully stocked so that he can complete the job in one visit.